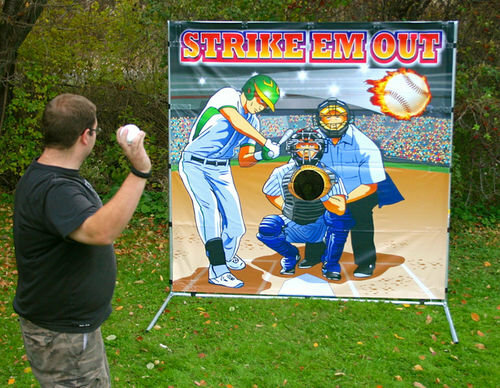 The Strike Em Out baseball toss frame game is a winner at any sporting event, fundraiser, or carnival. We've taken the great American pastime and turned it into a simple, but irresistible game! Nobody can walk by the Strike Em Out baseball toss game without giving it a shot. Strike Em Out can be set up in less than five minutes and can be used indoors or out. Each frame game comes with a colorful and rugged canvas, as well as a heavy-duty framework. Plus, it all breaks down to fit into its own wheeled carrying case for easy storage and transportation. Best of all, it can be set up in minutes by one person. $75 plus tax per day!